If you are in Penang or anywhere in Malaysia, it is time to step up to the challenge. Now is the time to volunteer your time. We need your help. Our team needs you from all parts of the country. The time has come to shift gears; talk to your friends about DAP and to even shake the hands of our team all over the country. It’s time and the time has come to step up. Over the past year I have received repeated requests from the DAP Penang State Committee and conducted many discussions in the Central Executive Committee (CEC), to lead Penang DAP in the 12th General Elections. Due to the prominence of Penang to the DAP as a front-line state, both Penang DAP and the CEC have stressed the importance of the leader of the party contesting in Penang to show the importance that Penang plays in the 2008 general elections. I have decided to contest in Penang to lead the people’s movement of change from UMNO’s political dominance towards a functioning democracy with checks and balances as well as moving forward with a dynamic Penang that is shared by all. I humbly offer myself to the Penang to join in this people’s movement of change inspired by one single motivation that we as a country has somehow not realized our potential or fulfilled the promises made and can do so much better. Let us together share and learn from each other so that we can do better. Penang was once the leading economic state in Malaysia. Penang also led in brain power the center for democracy and progressive change. 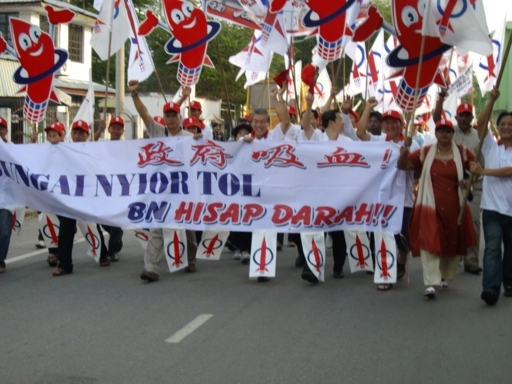 However after suffering three consecutive devastating defeats in the 1995, 1999 and 2004 general elections, Penang is no longer the most developed state in Malaysia when its average annual growth rate from 2001-2010 of 6.1% (according to the Ninth Malaysian Plan) losing out to Selangor and even Johor, the mean monthly income of RM 3,531 is No. 3 in the country after Selangor’s RM 5,175. Despite all the promises of the Northern Corridor Economic Region (NCER), how much of this RM 177 billion in investment is earmarked for Penang and the other states? Compared with Johor’s Iskandar Development Region (IDR) with RM 383 billion target over 20 years for Johor alone, Penang has clearly lost out in the race for foreign investment by having to share RM 177 billion with three other states of Kedah, Perlis and Perak. Most projects are privatized leading to the people finally bearing the burden of the costs of the Penang Second Bridge or the highways. The question is why can’t the government use RM 4 billion from the annual RM 70-80 billion profits from Petronas to build the Second Bridge for free for the people of Penang? Penang was also the center of democracy with the first local government elected in then Malaya in the 1950s. However with one-party control by BN and UMNO, the people have lost their rights and have to suffer from the incompetence, even corruption and lack of accountability, especially in local government services. For instance, the Penang Global City Centre (PGCC) was not even mentioned in the Penang Draft Structure Plan 2005-2020, which is required by law for statutory urban planning, and yet it was approved in 2007. DAP is puzzled how Prime Minister Datuk Seri Abdullah Ahmad Badawi can launch the RM25 billion PGCC on 12.9.2007, when it has not been even approved by the local authorities. Residents’ protests against the PGCCat the increased traffic congestion and the need of more public parks are ignored. What is the point of having a Draft Structure Plan that is not even complied with by the government? Or why the illegal building put up by UMNO Tanjung not torn down whilst a Chinese temple Tow Boo Keong in Bukit Mertajam is torn down? There is no more respect for the law. The NEP has hindered economic growth. When it was introduced, Malaysia ranked third only to Japan and Singapore among East Asian nations in terms of GDP per capita; by 1990 it had fallen behind South Korea, Japan and Hong Kong as well. Had growth not been constrained by the NEP, it is argued, the economic performance and welfare of the bumiputera would have been even more greatly enhanced. The NEP must go and be replaced by a Malaysian First Policy that stresses on ability, needs, competitiveness and shared prosperity. The high cost of living has eroded our living standards. Even though the government claims that inflation rate in 2007 is only 2%, this is a lie as the true situation on the ground is closer to 20%. The BN government can afford to help the people by distributing Petronas profits to the people. That the BN has failed to do. The crime rate continues to escalate at a frightening rate. The government can keep us safe by employing 100,000 more police personnel to patrol the streets to protect us from criminals. That the BN has failed to do. The government can wipe out corruption in the police force by setting up the Independent Police Complaints and Misconduct Commission recommended by the Royal Commission of Inquiry. That the BN has failed to do. The time has come for the people to act on what BN has failed to do. March 8 is the day when the people must pass their verdict of the BN’s failed report card. We must prove that Malaysians demand better and good governance. Finally, to make Malaysia safe for democracy, Penang must lead the battle to check and reduce UMNO’s political dominance. After this general elections, the Elections Commission will conduct a new constituency redelineation exercise requiring an amendment to the state constitution, which requires a 2/3 majority. The redrawing of boundaries will lead UMNO to demand an increase in their seats to achieve their final objective of grabbing the Penang Chief Minister’s post. Everyone knows that no Gerakan or MCA State Assemblyperson would dare to say “NO” to UMNO’s proposals to increase UMNO’s seats. Only DAP dare to say “NO” to UMNO. To prevent UMNO from increasing their political influence, the people of Penang must ensure that DAP wins 14 state seats in Penang to deny BN its 2/3 majority. DAP is willing to even support the Gerakan candidate to ensure that the Penang Chief Minister’s post do not fall to UMNO. Let us work together in this final battle for democracy for both Penang and Malaysia so that we not only have a voice but an equal place under the Malaysian sun. I humbly offer myself to Penang voters to serve them be their voice and learn from them as to how together we can make Penang and Malaysia not only better, fairer, freer but also give equal opportunities to do well and enjoy shared prosperity. Let us have a Dynamic Penang shared by all!